When I considered "Empty" this is what came into my head. It's from a fantasy novel by Poul Anderson - Three Hearts and Three Lions - an empty suit of armour lying in a field of asphodels, that was a lively unearthly warrior shortly before. The book blazes along and is a great pulp fantasy adventure that I read in my teens. It refers to Twain's A Connecticut Yankee in King Arthur's Court at points. The empty suit of armour is an image used in quite a few books and films - please mention any you can think of below! The picture was drawn in black pencil, then painted in watercolour washes, with acrylics (and a little coloured pencil) for the details. My other ideas for "Empty" were seashells - I remember painting some sea animal designs to be painted onto dinnerware, and I drew them all with live beasties in them, to the consternation of some :). What a great idea for empty...that certainly conveys it well! Nice composition and colors too! What an excellent idea, Ian. I love it! it looks like the empty suit of armour just need some soul to fill it up. i saw one movie, but cannot remember the title. your illustration conveys emptiness and also a positive surrounding that makes it hopeful. Yay, Aravis! I hadn't thought of Bedknobs and Broomsticks! Any others, anyone? Anonymous, I've replaced the scan, but I'm not sure I like this one any better... I think the Faerie knight dissolved when the iron hit him - either that, or the armour was always empty. This is definitely one of the most fanciful and cool takes on the topic! I love the position -- freshly fallen. Thanks for sharing your technique. As I have only a quarter tank of caffeine and it's way too early to think, I can't come up with a literary reference...if something comes to mind later, I'll post it. OOhh, the new scan is very much clearer, I can see each marks' texture now :) Empty armour of Faerie knight is magical. This drawing looks magicial. I agree with the commentor who said it conveys emptyness, while also giving a feeling a hope with the pretty background. Lovely. Enchanting! I love the asphodels, and the shine of the metal. A fantastical depiction of emptiness, indeed. I can't recall specific references to empty suits of armor, but as soon as I saw your picture I thought of Lloyd Alexander's Prydain chronicles, for some reason, and also the gallant paladin, Sturm, standing proudly at the Inn in his worn and nicked armor, from Dragons of Autumn Twilight. oh yeah this is fine! i could be wrong but was there an empty armour suit in the film Ladyhawke? I really like this Ian! I like how you used the black pencil, I'd love to try a comic this way one day to get that nice textured line. I saw a great kids book about robin hood done in a similar style. Did you have any problems with the black pencil making the watercolours dirty? I think I might have seen that Robin Hood book! One I really like is the Robin and Marian book illustrated by Emma Chichester-Clark (also line and wash), which is a bit more cartoony. ohhhh, now i'm going to be up all night thinking about literary references...and i can so picture it all in my mind, but cannot as yet place where i've read/seen similar renderings. but i love this, so fairy-taleish and whimsical, a million stories can be woven around this one picture. excellent! this is a great idea for empty. 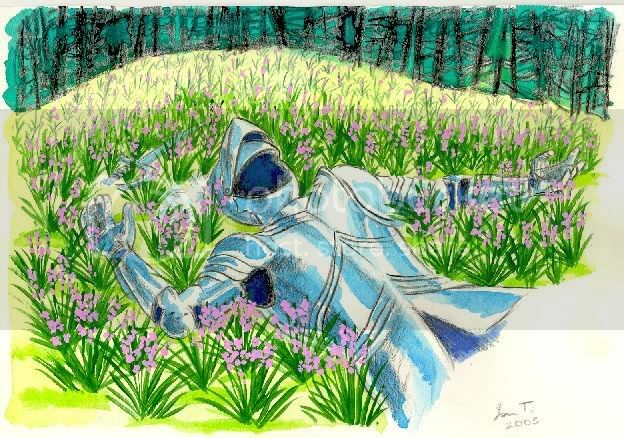 That empty knight looks quite comfy there on the grass... I think I'll go lay out in the grass for awhile and look up at the clouds (I've been inspired). Are there any empty suits of armour in the Narnia books?--seems there would be, but none are coming to mind. Angelique, thanks for mentioning Lloyd Alexander's underrated and often overlooked Chronicles of Prydain (which I've always thought inspired David Eddings' Belgariad). I did a lot of pictures of those characters in my teens (before the Disney film of The Black Cauldron!